Preliminary results for Wall Street’s competitive league-table rankings are in. 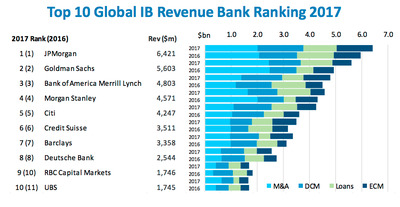 JPMorgan is set to retain bragging rights as the top overall investment bank. Races in other lines of business – like equity capital markets – are too close to call. The year in dealmaking is closing with a bang, with late-arriving megadeals shaking up some of the rankings of Wall Street’s top investment banks. With just under two weeks to go before close of the 2017, Dealogic is out with its preliminary results for the year in investment banking – and it’s looking like another big year for JPMorgan. 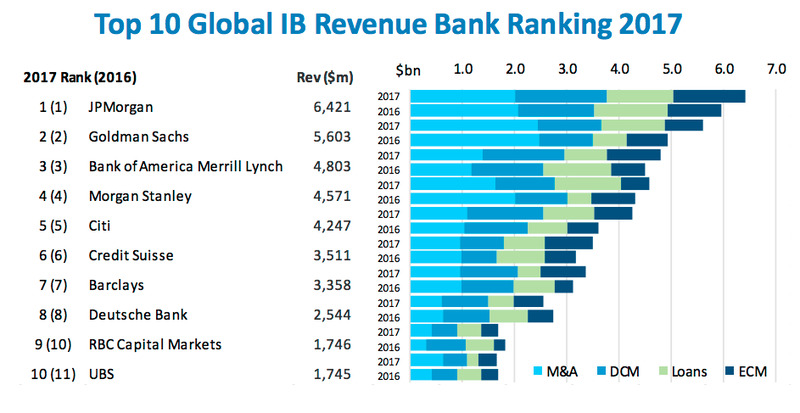 Some league-table races are all but over: With $US6.4 billion, JPMorgan has a healthy lead in overall investment-banking revenue. Goldman Sachs trails by $US820 million in second place. But some lines of business will come down to the wire: In global equity capital markets by revenue, Morgan Stanley leads JPMorgan by just $US4 million, $US1.270 billion to $US1.266 billion. Across the industry, revenue increased to a three-year high of $US78.1 billion, led by the revival in global ECM, which saw a 25% increase in annual revenue to $US17.6 billion. A wave of announced megadeals have made the fourth quarter the sixth-busiest quarter for mergers and acquisitions in the past decade, according to Dealogic. The four largest tie-ups of the year were all announced in Q4, including Broadcom-Qualcomm ($US130 billion), CVS-Aetna ($US69 billion), Disney-21st Century Fox ($US69 billion), and Hochtief-Abertis Infraestructuras ($US42 billion). Still, it’s a down year overall for global M&A, falling 9% to $US3.52 trillion. JPMorgan is set to retain its crown as the top overall investment bank. In general, there was very little movement from the overall revenue rankings from 2016. Goldman Sachs appears a shoe-in to retain bragging rights for revenue from global M&A. The firm had a leading role on the three largest deals of the year — Broadcom-Qualcomm ($US130 billion), CVS-Aetna ($US69 billion), Disney-21st Century Fox ($US69 billion). Goldman Sachs also leads global M&A by volume. But the story here is boutiques: Evercore climbs to 8th from 11th, and Centerview Partners — a firm of just 37 senior bankers — jumped to 7th from 12th after landing assignments on both December megadeals: CVS-Aetna and Disney-21st Century Fox. JPMorgan leads in revenue from global debt capital markets. It was a record year for high-yield bonds with $US498 billion issued, up 46% from 2016. Citi jumped JPMorgan for first place in global DCM by volume, with $US483 billion in deals. The $US6.74 trillion in overall global DCM volume ties 2016 for the largest year on record. Global equity capital markets revenue is too close to call. Morgan Stanley leads JPMorgan by just $US4 million, and by market share they’re tied at 7.2%. Goldman Sachs is lurking not far behind in third. This race could still flip before the end of the year. Global ECM by volume rebounded after an icy cold 2016, climbing 16% to $US843 billion. This race is also close, but Goldman Sachs leads Morgan Stanley by market share — 7.8% to 7.7%. JPMorgan has dropped from first to third.